Here’s what happens when professional creators get geeked about somebody else’s work in another medium: They drag it, sometimes kicking and screaming, into their own. Nike brand designer Darrin Crescenzi got obsessed with HBO’s Game Of Thrones series, then read the inspiration for the show, George R.R. Martin’s Song Of Ice And Fire books. 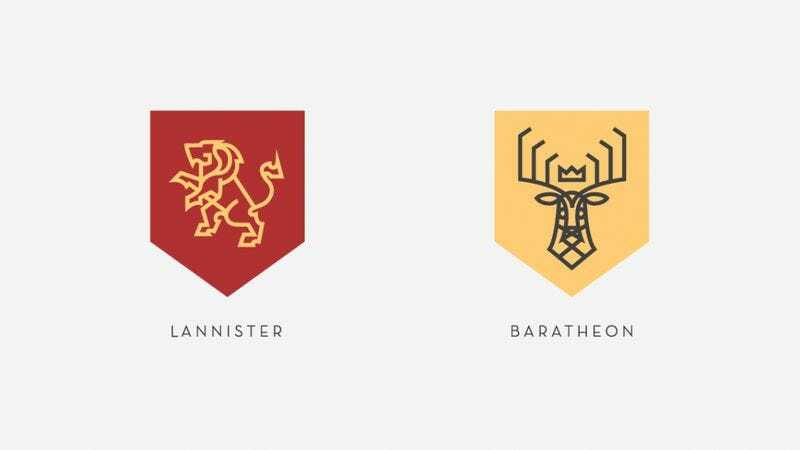 He eventually picked up a notebook and started jotting down the details of Westeros’ house sigils, then designed his own versions, thinking of them as if they were corporate logos. And it certainly is easier to picture these drab, minimalist icons on letterhead stationary than on the bloody, battered shields of the various houses’ knights. Perhaps if House Stark had sent House Lannister a sternly worded cease-and-desist order early on in the series, on official stationary stamped with the Stark direwolf, all this unpleasantness might have been avoided—or at least solved over coffee in a boardroom somewhere. At any rate, Crescenzi’s ultra-clean-and-simple logos aren’t generally that compelling on their own, although his version of House Bolton’s flayed man is amusingly iconic and high-concept. But Fast Company Design’s interview with him, about Game Of Thrones houses’ “brand voice” and iconography, is a fairly fascinating look into how designers see the world, and how Crescenzi in particular interpreted Martin’s work through his own specific lens. His icons are available on a poster, which retails for $35 at his website, though the $250 limited edition has already sold out.